Behold, my servant shall act wisely; he shall be high and lifted up, and shall be exalted. As many were astonished at you– his appearance was so marred, beyond human semblance, and his form beyond that of the children of mankind– so shall he sprinkle many nations; kings shall shut their mouths because of him; for that which has not been told them they see, and that which they have not heard they understand. Who has believed what he has heard from us? And to whom has the arm of the LORD been revealed? For he grew up before him like a young plant, and like a root out of dry ground; he had no form or majesty that we should look at him, and no beauty that we should desire him. He was despised and rejected by men; a man of sorrows, and acquainted with grief; and as one from whom men hide their faces he was despised, and we esteemed him not. Surely he has borne our griefs and carried our sorrows; yet we esteemed him stricken, smitten by God, and afflicted. But he was pierced for our transgressions; he was crushed for our iniquities; upon him was the chastisement that brought us peace, and with his wounds we are healed. All we like sheep have gone astray; we have turned– every one– to his own way; and the LORD has laid on him the iniquity of us all. He was oppressed, and he was afflicted, yet he opened not his mouth; like a lamb that is led to the slaughter, and like a sheep that before its shearers is silent, so he opened not his mouth. By oppression and judgment he was taken away; and as for his generation, who considered that he was cut off out of the land of the living, stricken for the transgression of my people? And they made his grave with the wicked and with a rich man in his death, although he had done no violence, and there was no deceit in his mouth. Yet it was the will of the LORD to crush him; he has put him to grief; when his soul makes an offering for guilt, he shall see his offspring; he shall prolong his days; the will of the LORD shall prosper in his hand. Out of the anguish of his soul he shall see and be satisfied; by his knowledge shall the righteous one, my servant, make many to be accounted righteous, and he shall bear their iniquities. Therefore, I will divide him a portion with the many, and he shall divide the spoil with the strong, because he poured out his soul to death and was numbered with the transgressors; yet he bore the sin of many, and makes intercession for the transgressors. Grace and peace to you from God the Father and our Lord and Saviour Jesus Christ! Good Friday. Almost 2000 years ago, almost at the same time, at 3pm, Jesus from Nazareth died on the cross. Innocent. Mocked, ridiculed, humiliated. It was a violent, violent moment. Sun darkened and the entire creation shook in revulsion. The Lord of creation had died to save His human creatures. To save us. To save each one of you. As we remember this event there are two things which we can see very clearly as we look at the cross of Jesus. And these two things are, – incomprehensible depth of our sin, and even more incomprehensible love of God. Even we, Christians, can’t fully realize the seriousness of our sin. Even if we acknowledge and believe and repent of our sinfulness, we are a bit like people with mental illnesses, who live in the world of their illusions and don’t even realize how tragic their situation is. It is similar with us. But Good Friday is a wake-up call. Jesus Christ, the Son of God, dies naked on the cross, with His hands and feet pierced by nails. He dies because of our sin. Because of mine and yours. What Jesus had to experience was not an imaginary suffering. He was true human being, in His human nature no different from us. He knew what awaited Him. Jesus was sweating blood, so scared and desperate He was. “Father, if there is another way… .” But there was no other way. There was no other way to deal with our sin, with mine and yours. The Son of God, Jesus Christ had to go the whole way to the cross. 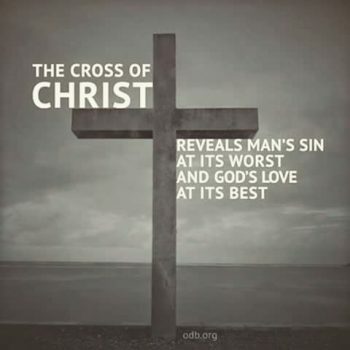 If you ever wander “is our sin really such a big deal”, as it often doesn’t seem so from our perspective, then look at the cross where God’s own beloved Son hangs, and remember, – there was no other way. No easier, no less terrifying, no less painful way to deal with our sin, than Jesus death on the cross. It was our sin, in our hearts, in our thoughts, in our words and actions that crucified Jesus. If you want to know how serious our sin is, look at Jesus on the cross. But then there is this other thing that is revealed to us from the cross. And it is God’s incomprehensible love. If the seriousness of sin is hard to grasp, then it is impossible to comprehend the depth of God’s love. Have you ever done something that scared you? Maybe something very unpleasant, or something painful or frightening? We all probably have experienced at least something that fits this description. Now try to remember, how was it to look forward to this experience? How was it to wait for the day and time when you would have to go through it? And the closer such time came, the harder it got. We already die thousand deaths before this experience even comes. The Lamb that was slain from the creation of the world. What else could this mean, but the fact that the Son of God knew what He will have to go through from the creation of the world. Then think about the garden of Eden. Human being were created to live in God’s presence, but because they wanted to be like gods, sin and death came into this world. Who went looking for them? Who called Adam? Who was it? The eternal Son of God. It defeats our reason, but as soon as Adam had sinned the Son of God came to Him and … no, He didn’t destroy us, He didn’t abandon us, He promised to take care of the terrible damage that was done to entire creation. We don’t know how long ago it happen. But we know that seven centuries before Jesus’ birth it was revealed to Isaiah the prophet, what will happen, what the Son of God, God’s suffering Servant will have to go through. Seven centuries of waiting for this to happen. Then when the time was full, the Son humbled Himself, He left His divine glory and was born as one of us. And as He lived among us, He knew why He was born. He was the only person who was born to die. To die on the cross, so that through His wounds we would be healed. How is it to live with the clear knowledge that your whole life is heading towards the death on the cross? This is how the cross on Good Friday reveals us God’s incomprehensible love and determination. What kind of love is this, that can make someone so determined? This is what your God, Jesus Christ, is like, and this is what His attitude towards you is. He knew from the creation of the world what He will do for you. But He also knows from the creation of the world that you will be with Him. The Holy Spirit is clear saying that God has chosen you from the creation of the world. We can’t understand what determination it is, but we can understand what it means for us. If God loves you so much, that He is so determined to save you, that nothing could stop Him, nothing could hinder Him on His way to the cross, then it is quite clear that nothing will stop and nothing will hinder Him from taking your sins from you. He will most certainly do it. And further, nothing will stop Jesus Christ from having you with Him. He has all the authority in heaven and on earth in His hands. And in His incomprehensible love He has decided that you will be with Him, and He will surely accomplish what He has decided. This is how the cross reveals to us God’s love. It is terrible what happened with Jesus and what He had to go through. But now, when He has done it for you, even when you still were His enemies and slaves of sin, how much more He will grant you all His eternal blessings now when you are children of His Father and His brothers and sisters. Even as the cross reveals how terrifying our sin is, it also encourages and assures us of God’s love and His determination. He will get you in His Kingdom. You will be with Him. And this is most certainly true. Peace of the Lord that surpasses all our understanding, keep your minds and hearts in Jesus Christ. Amen.